Little Bit Funky: mom stuff. First of all...I had to document this here...you know, so it will be included in a future edition of my blog books. 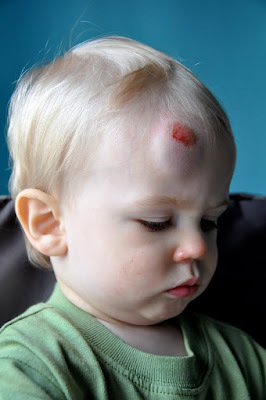 We were playing around in the tennis courts at a nearby playground when one of the poor little guys legs gave out on him...he immediately got the largest gooseegg that I have ever seen on someones head. It stuck out a good 3/4-1in instantly. This kid is one tough little man...he was done crying about it before we could get back to the car...and resumed his normal self. My heart, I am sure, may never be the same. And the rest of this...is just to share. A couple of my sneaky little mom tricks. Both of my boys eat a great healthy breakfast and lunch. Neither has ever been big on dinner. Our general policy is...you eat what you are served at dinner...or you don't eat. But I refuse to make them eat...I just think that sets them up for bad eating habits in life...but I will include at least one thing with dinner that I know they like. Moses knows the deal and he knows that if he doesn't eat what we serve for dinner then he gets nothing else for the rest of the day...and only water to drink...cause this boy could live on milk. If they don't eat dinner...I don't worry because I know that what they HAVE eaten that day is healthy and good for them...we try hard not to keep junk in the house (except for the secret mommy/daddy chocolate stash) and we never really eat fast food besides Chick-fil-a or Chipoltle. Aaron...well he is still trying to figure out what he does like and what he doesn't like...a favorite one day is hated the next. But he will always eat yogurt or oatmeal. And like Moses, everything he DOES eat is healthy...so I don't worry about dinner so much if he doesn't want it. Which he loves...has a serving of veggies (which he will only sometimes eat on his own) and a serving of fruit (which he loves in any form) and is low in sugar (which makes me happy). So those are a couple of my tricks...in case you didn't know and could use them for yourself. Any good "sneaky mom tricks" to share? We loved the Odwalla juices/smoothies when Bubbalu was in that 12 to, well, 28th month stage of not eating hardly anything. I knew they were packed full of nutrients so felt great about supplementing his meals with them. However, he could have survived on Odwalla and milk alone, so you DO have to be careful! We also loved V8 Fusion splash. 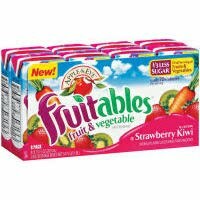 Full serving fruit and veggies in every serving. Not too shabby! My kids like dannon "monkey milk"(the little mini bottles have a monkey on the front). It is like a yogurt smoothie. We discovered this when my boy knocked is two front teeth out and needed only smooth items to ingest. It is gross and full of sugar and I would never have purchased it to begin with if not for the teeth tragedy. SO, the trick is that I kept the mini bottles and now put kifer probiotic in it instead of "monkey milk" Afterall, it is all about the packaging...right? put some vasiline on that bump - helps minimize the bruising!!!!! My 20 month old son LOVES spinach dip. I just take some frozen spinach, stick it in the microwave to thaw it, add in a few spoonfuls of cream cheese and some parmesan and he eats it up. He would just eat it with a spoon, but he likes to dip tortilla chips in it. An easy way to get him to eat spinach! I've also put pureed veggies, like a baby food cup, in with spaghetti, like spaghetti sauce, for lunch for him before. He loved that too. And I totally agree that juice with veggies in it counts. 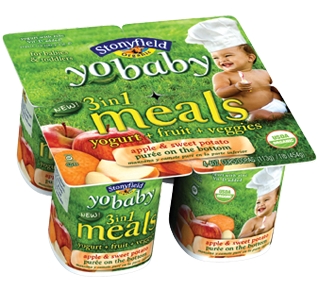 I love those YoBaby things! : ) AND that bump on his head is ridiculous!! Mine fell off the arm of the couch at my sister in law's house face first onto marble tile and he didn't get an egg like that. Just crazy. It was the worst sound I've ever heard in my life! Okay wow, next time please post pictures of that sort farther down in the post. I literally gasp when I first opened this post and saw that picture. Poor kid! Hope that gets better soon! I literally GASPED as soon as I saw that photo of your tough little guy. Poor thing. Glad he's OK. Thanks for sharing eating tips. Emma (18 mos.) is a lot like Moses...getting picker everyday...so thanks for the ideas. PS - we got the "funky monster" and LOVE it. Hoping to get some good pics of her with it to send. I am a fan of hiding the veggies in sauces. My girls love whole wheat pasta. I grate 2 zucchinis or some carrots or whatever veggies is around and plop it into the sauce. It makes it really thick and they don't even know what hit them. My hubby saw me grating and plopping one night and told me to just make the pasta how I normally do. I had to tell him that I was. Even fooled him! Put the sauce on pizzas too. English muffin ones. ok. I'm hungry now! Love Revolution Foods snack products including their fruit mashables. They are organic and contain nothing but fruit! My now 17 year old daughter fell out of a stroller, got a giant goose egg (not that big, tho). When she hit, it was where 4 tiles met-she had a cross on her forehead for a week! ouch! that is quite the bump! oh yeah, you definitely got the mama's heartache worse than i did! thank goodness the body has an amazing ability to heal itself! That is quite the bump. Poor guy! I love YoBaby, but have never tried the juice you pointed out. We are trying to develop those same rules with our little girl. I try to look at the overall average of what she eats throughout the day rather than focusing on each individual meal -- but we're all learning! Her eating is constantly changing. One day she can't get enough and the next she doesn't want to eat a thing. Always keeping us on our toes, aren't they? Oh so sad. :( Poor little buddy. I would have cried longer than that. Thanks for the tips! Mine only eats broccoli and we all know what too much broccoli does! ouch! I hope Aaron is doing ok now. We've experienced the goose egg bump and it's scary. It's crazy how quickly it appears. Luckily these little ones are so resilient! Thanks for the tips...I'm going to keep my eye out for both the yogurt and juice. I want to give them a try. Eeeeeeeeeek...that is a BUMP! Glad he's okay! Chase got his first black eye this weekend and it makes me sad every time I look at it! Great tips- gonna have to check both of those products out! My sister had told me about the veggie yobaby stuff but I'd forgotten!